This is basically a social affair celebrating the interesting food movement known as molecular gastronomy (look it up). Generic description (i'll try to get a better one). 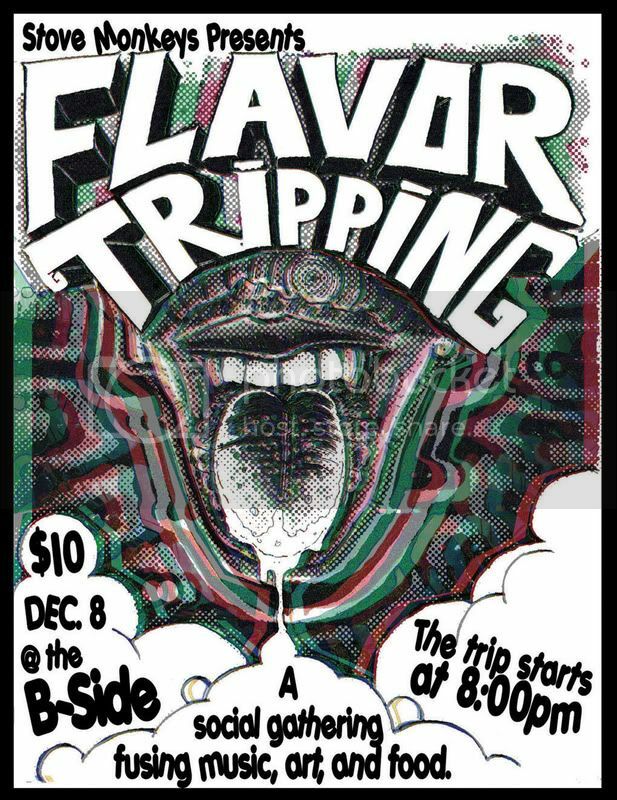 This is an extraordinary event called "Flavor Tripping", presented by Cleveland taste makers, Stove Monkeys. If you aren't already familiar with the Stove Monkeys, they are a design company with an emphasis on t-shirts for dining and culinary professionals. " Flavor Tripping" is a chance to step out of your comfort zone and get your hands on extreme bites like Curried Caramel Crab Apples and a Chicken (Liver) Salad. This event is not only for the brave and daring though, after the event is well under way, West African berries will be handed out. These berries have special powers in that they turn what's normally sour or salty into sweet. If you ordered a Guinness at the bar, it would taste like a Chocolate Milkshake. If you drink lime juice, it will taste like a sweet fruit candy. This event offers a rare glimpse into the world of molecular gastronomy, the scientific study of physical and chemical processes of cooking. "Flavor Tripping" also will feature works by food-inspired photographer, Dean Saur. This will be a spectacular social gathering with tons of different fun and interesting foods to try out, don't miss out! I should add, this is half sold out. If you're interested in purchasing tickets, please contact me (they are available through ticket master, but you will pay more there). I want in, save me a ticket! Woodle, you're leaving the door wide open....I'll refrain this time!